DAUMIER -Tout ce qu'on voudra. Au restaurant à 32 sous. Garçon . . . (Stone number 1279). DAUMIER, H. - Tout ce qu'on voudra. Au restaurant à 32 sous. Garçon . . . (Stone number 1279). Tout ce qu'on voudra. Au restaurant à 32 sous. Garçon . . . (Stone number 1279). - DAUMIER, H.
Title : Tout ce qu'on voudra. Au restaurant à 32 sous. Garçon . . . (Stone number 1279)..
Map maker : DAUMIER, H.. Date : Paris, 22 November 1849. Size : 10.2 x 8.0 inches. / 26.0 x 20.4 cm. Description :Caption in English : AT THE RESTAURANT AT 32 SOUS. - Waiter, a chicken with watercress. - Monsieur, we are out of chicken, but I could bring you a double portion of watercress. Print taken from TOUT CE QU'ON VOUDRA. (As you like it). This series consists of 94 lithographs published between March 28,1847 and November 30, 1852 in the Charivari. This edition has no plate number, some of the plates carry numbers (53). 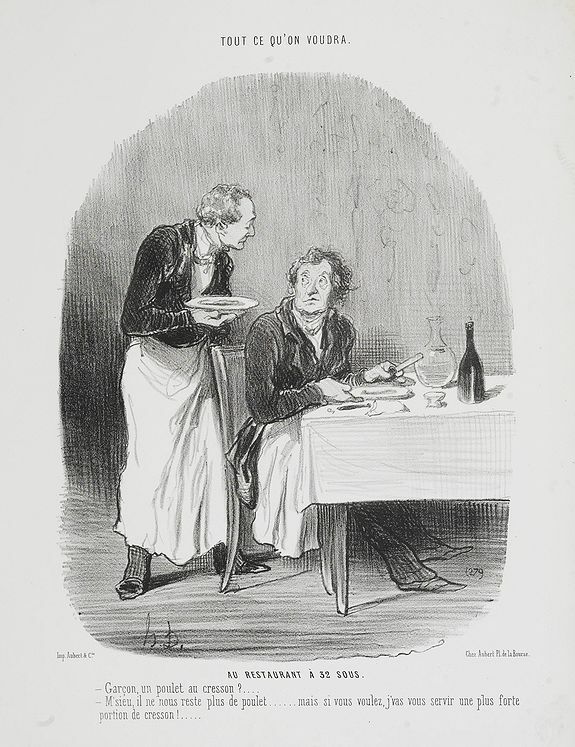 Similar to the series "Les bons bourgeois" the prints of the present series are dealing with numerous small misfortunes in the life of the Parisians. They were especially impressed by the possibilities opened by the railroad. Travels to the surroundings and the French province were both exciting and startling experiences. Apart from these drawings, this series also offers beautiful observations like the elderly couple remembering youth, memories and transience with a pensive humour, and never offending.Apart from these drawings, this series also offers beautiful observations like the elderly couple remembering youth, memories and transience with a pensive humour, and never offending. Printed and published by Aubert & Cie at Place de la Bourse. Text written by Alphonse Jean LAURENT-JAN (1808-1877) who was a journalist, writer and associate at the Charivari, where he wrote captions for Daumier's lithographs. He was also a friend of Balzac. Known chiefly as a political and social satirist, Honoré DAUMIER used the printmaking process of lithography, still relatively new at the time, to contribute cartoons and caricatures to French news weeklies. Condition : Litho printed on white wove paper without text on the verso. A very good and dark impression.